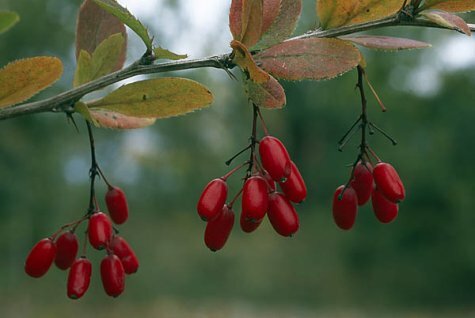 Barberry bushes are mostly found in North and West Estonia, at the verges of forest roads, in dry meadows or sparse forests, always in calcareous habitats. Of course the clusters of red, oval berries are eye-catching – very sour, juicy and edible. The tiny oval berries grow in clusters and contain two to three hard-shelled seeds. In addition to being rich in vitamins they also contain valuable acids and sugar. The berries turn tastier after a frost bite. The branching shrub grows a couple of metres high, seldom three. The leaves are narrow, tiny and attached to the branches in bunches that have needle-sharp three-forked spine leaves at the base. On young shoots there is only one spine. For ornamental planting the Japanese barberry / Berberis thunbergii /, is used, but its berries are not for eating.